The Archaic Period marked the extensive development of new technologies and subsistence patterns in many parts of North America. It is divided into the Eastern Archaic Tradition and the Western Archaic or Desert Tradition, both of which had an influence on Manitoba. The driving force behind the transition from Palaeo to Archaic lifeways was most likely a change in climate, especially the ending of the Ice Age and a shift to much warmer and dryer conditions that marked the Atlantic episode, beginning approximately 8,000 B.C. Reduced supplies of water and vegetation as well as increasing pressure from highly effective hunting bands led to the disappearance as much as 95% of the North American big game species. (See Peter J. Bryant 1996, Extinction and depletion from Over-Exploitation: Late Pleistocene Extinctions for further details.) To compensate for the disappearance of their traditional food sources, Native peoples invented new survival strategies and increased their exploitation of a broad variety of small mammals, waterfowl, fish, and plants. This new pattern has been called the "Broad Spectrum Revolution" and typifies not only the North American Archaic, but also the European Mesolithic and the African Later Stone Age, which represent similar responses to ecological changes that were occurring on a worldwide scale. Technologically, the Archaic is marked by the appearance of stemmed, notched or barbed broad bladed projectile points, considerably smaller than those of the Palaeo Period. 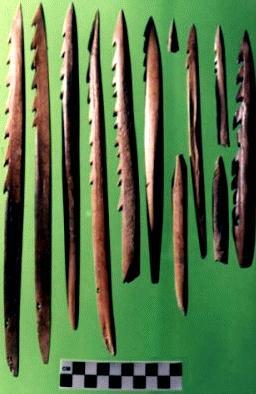 They were crafted for use with an atlatl, or throwing stick, which came into wide use during the era. In many areas is it also marked by the appearance of ground stone tools, such as axes and milling stones, called manos and matates, These toolkits were probably developed to take advantage of the new resource base. The more intensive exploitation of local environments also simulated a change in settlement patterns towards greater sedentism, i.e. more prolonged use of individual living sites and in some cases permanent occupation ( Willey 1996). The increased localization and ecological specialization of the period supported a the development of several distinctive cultural traditions within and across major geographical zones. The cultural phases and traditions within this period developed between 6,000 B.C. and A.D. 1, the earliest cultural evidence in the Manitoba region dating from 3,500 B.C. The relatively late Archaic settlement in the Province may be due to drought conditions across the Plains. Once the climate improved, populations increased substantially and for the first time extended into the Arctic zone along the Hudson Bay Coast. As elsewhere, the Archaic Period is marked in Manitoba by changes in climate, vegetation, food resources, and human activity. The climate was warmer and drier than Palaeo conditions. The last of the ice sheets melted and Lake Agassiz disappeared. Relieved from the pressures of ice and water, the land continued to rise and tilt, and Manitoba's current lake and river system took shape. Periodic occurrences of drought reduced water supplies, creating desert conditions in the central part of the province and expanding the bison grazing areas to the north and east. Modern bison (Bison bison) replaced the long horned Bison antiquus, probably because of the ability of the smaller animals to survive dry periods. Manitoba Native Peoples in Archaic times changed their food acquisition strategies to meet changing conditions. 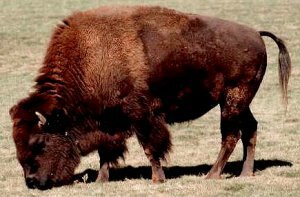 On the extensive grasslands they developed new hunting technologies and techniques to exploit the smaller but still formidable bison, which remained the mainstay of the economy until the 19th century. They also diversified their food resources to include deer, wolf, rabbit, fox, and wild plants such as gooseberries and cherries, a pattern that was repeated in other environmental zones in the province. Similar trends occurred on the tundra and in the boreal forests. Characteristic tools included small chipped stone projectile points and knives. Manos, matates and other ground stone tools associated with Archaic in other areas of North America have not been found in Manitoba sites. The Manitoba Archaic also provides the first direct evidence of many aspects of culture not yet well documented for local groups in previous times. Native peoples of the period interred their dead in formal burials repleat with grave goods, suggesting an elaborate belief system.